the blessed Holy month of Ramadan, Medical wing of Pakistan Association Dubai (PAD) organized a Health Awareness Camp on Friday, 24th June 2016 at the Transguard Labour Camp Muhaisna, Dubai. It is part of the initiative by Community Development Authority, Government of Dubai called “Honor Labor” and social responsibility which creates health awareness and motivates blue collar workers to adopt healthy habits. The tagline of the activity was “Your Health is Community’s Health”. 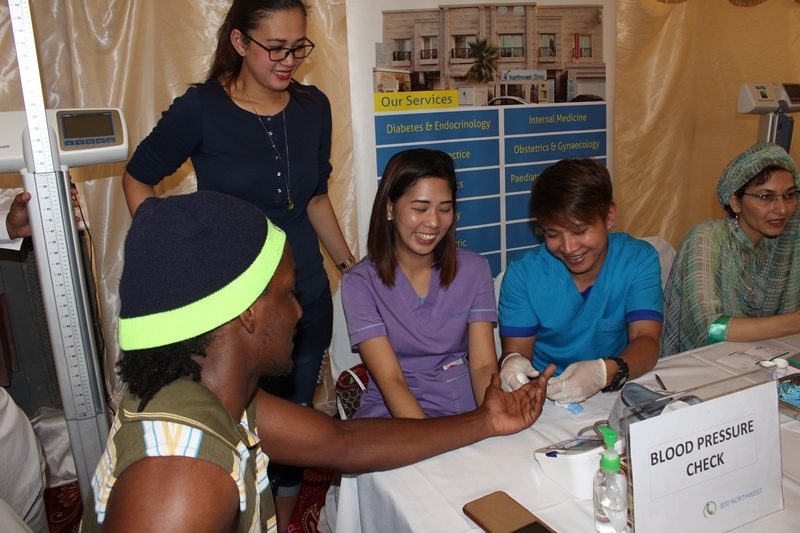 More than 1,000 labourers were screened during the health camp for basic health checks like blood pressure, blood sugar, cholesterol and BMI, dental, ortho, dental and eye checks. Health Awareness Lectures on diabetes, hypertension, hand hygiene, smoking and oral hygiene were given by health professionals and free consultation provided by the doctors. Dr. Omar Al Muthanna (CEO of Community Development Authority) was the chief guest of the occasion, in his speech, he appreciated the Medical wing of Pakistan Association, for organizing health awareness camp in this Holy month of Ramadan. He also praised the initiatives taken by Pakistan Association Dubai towards community welfare. Dr. Nighat Aftab (President of Medical Wing) mentioned that diabetics and hypertension remains undiagnosed in most of the labourers and they need regular screening for detection. Dr. Aamerah Shah (General Secretary – Medical Wing) said that the back and joint pain are the common health problem of laborers and with some exercises can be healed. Mr. Tahir Zaidi (Joint Secretary- Pakistan Association Dubai), highlighted the importance of these camps which the association has been doing as part of the “Honour Labour” initiative taken by the community Development Authority. He also hoped to start the construction of “Pakistan Medical Centre” soon which will serve as a non for profit facility for the community. Dr. Zia ul Hasan (President -Pakistan Association Dubai) thanked the management of the Transguard for providing an opportunity to serve the blue collar workers. He also thanked Dr, Omar Al Muthanna and Mr. Palani Babu (Community Development Authority) for their presence and patronage. A lecture on laborers rights was also part of the activity, First Lieutenant /Rashid Nasser Ali – Dubai Police conducted a lecture on the rights of blue collar workers and how they can be more aware about their rights. Another beautiful part of the activity was UMRA packages for the labourers. Valuable gifts and Iftar also were given away to the participants ,sponsored by Medical Wing. Gifts hampers from IFFCO were also distributed among the labourers. The American Hospital, The City Hospital, Northwest Clinic, NMC hospital, CEDARS Hospital, Super Vision Optical and Pakistan Youth Forum were the partner , Hospitals/clinics of the activity. IFFCO was Partner Company of the event.